1. What does the IR Recognition mean? 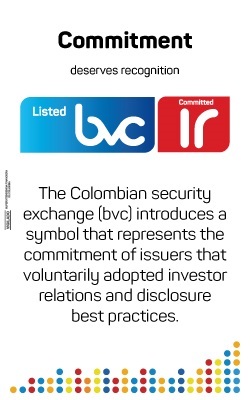 In order to make Colombia a more attractive market for investment, the Colombian Securities Exchange (BVC) promotes among listed companies the adoption of best practices on disclosure and investor relations(IR). List of issuers that have voluntarily adopted the best practices required by the BVC to obtain the recognition. Index that includes the shares of thecompanies with the IR Recognition within the COLEQTY index. Download documents and presentations about the recognition and investor relations.